A journey that includes (in no fixed order) the appreciation of culture through culinary exploration, long- and short-term contact with people and animals, and global discovery via geographical displacement. After a three-day trip to Sossusvlei from Windhoek, following an emotional departure from Harnas -- as is generally the case at the end of one’s last week -- I flew to Johannesburg then on to Victoria Falls, Zimbabwe the next day. Incidentally, I had a splendid night’s sleep at the Country Hideaway Guest House near the Joburg airport and would recommend a stay with Colin and Diane if you need a place to stay for a night or two. My arrival in Victoria Falls was nothing like I might have expected based on media and commentary from people before I left. Maybe I was sheltered, maybe not from the moment I arrived, maybe not. 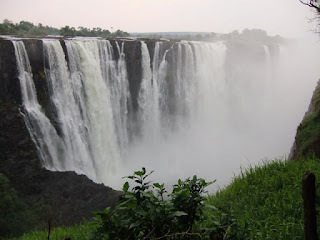 Having spent two weeks in Vic Falls and the surrounding area, interacting with locals on a daily basis, I would encourage people to go to Zimbabwe, especially the Victoria Falls area. As a general rule, people were very friendly, warm, and hospitable. They are of course eager to have people visit -- in part to help their incredibly depressed economy, in part to share stories with. 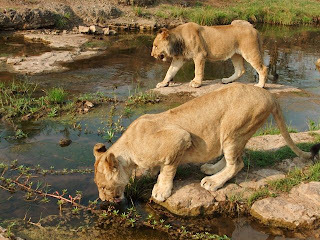 From a very early point during my stay there, I recognized that my time in Zimbabwe would be as much about the people I encountered as the lions, if not more so. This recognition or decision was brought to my attention a couple of times during my stay, once by new friend Adi (whom I’ll be visiting in Tel Aviv soon), once by Mike (from Afar). Speaking of people, I should point out that the African Impact volunteer program at Vic Falls was not without it’s challenges for me. It seemed from shortly after I arrived that volunteers and what’s expected of them were so incredibly different from how things were at Harnas. 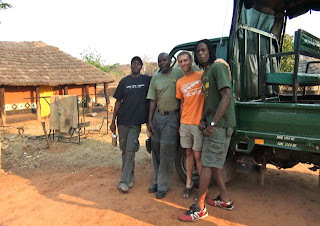 Whereas we worked very hard at Harnas every day, i t seemed that the situation of the Vic Falls volunteer program was more one of an eco-holiday where volunteers could take off a morning or a full day or several days to engage in some adrenaline sport or go on safari or do whatever they might like to do. The only work involved was either cutting up meat every other day or so for cub feeding, occasionally sweeping a lion enclosure area to keep it tidy and presentable, and going on walks with or without clients. I heard just before I left that this was going to change. Still waiting for reports from the trenches. 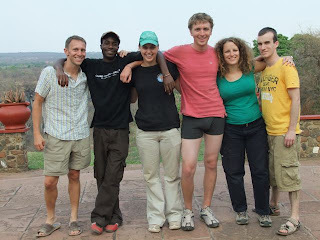 The very nice aspect of the AI/ALERT (African Lion & Environmental Research Trust) project is both the conservationist focus and the ecological research that makes up a significant portion of the program. At Vic Falls, the resident ecologist is Zibusiso Ncube (yes, for the uninformed ‘c’ represents a dental click in his last name). Zie quickly became a friend of mine who I already miss and hope to see again some day. -- Anyone know of projects in the US that would sponsor a skilled wildlife ecologist to come for a while? 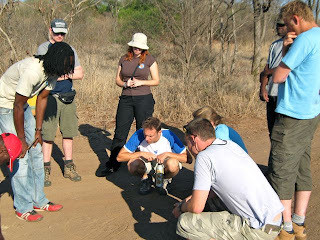 -- Curiously, although I was learning more from him and the guides and lion handlers and scouts and coordinators and other staff there, I was called "Professor" during my stint at the Masuwe project site. Conversations I had with the staff remain the more memorable and meaningful component of my time there. 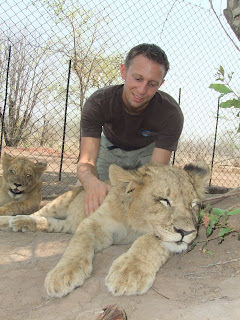 Surely, had I not spent three weeks at Harnas working and playing closely with lion cubs, cheetahs, vervets, baboons, turkeys, mice, snakes, vultures, and the like, my impressions about my Zim experience would be different. As it is, I’m very glad things worked out like they did and that I did both. working a bit on some of the more scientific aspects of the rehabilitation & release program: spoor measurement, behavior monitoring, etc. picking up and dropping people off on the side of the road who are presumably waiting for or coming from some other transportation rocks. Hopping on the back of the open air, no seatbelt truck with bench seats 5 ft in the air, rolling over gravel bumpy roads, etc. also rocks. Gift Mathe’s most famous braai on the night game drive! On the whole, food at the project in Zimbabwe was superb. On the whole, my time at the AI/ALERT project was superb. Swimming in the Zambezi river and only sort of caring about a crocodile who happened to be lying on the beach about six or seven meters away was just crazy. I’d also write about the safari I went on with Adi in Chobe National Park, but my eyes were closed for much of the time so that I can go back to Botswana with Shawna et al. one day. My nephew Mike told me about your blog. It looks like you are having an amazing time. We will be following your journey. I Paid HOW MUCH to be Seasick for This Long?" Malay I Have Some More, Asseblief?! Copyright 2008-2011 David M Rojas. All rights reserved. Powered by Blogger.